Head over to Hutch Bar + Eatery as they host their first beer dinner tomorrow Thursday February 18th with Brewery Ommegang out of Cooperstown, NY. Check out this menu and call to get your reservation. The dinner starts at 7pm and costs $50/person plus tax and gratuity. Reserve your spot by calling the restaurant at (804) 308-0115. Head over to the Facebook event for beer descriptions and updates. Lickinghole Creek Craft Brewery will hold their annual release (AKA Despot Day) of Enlightened Despot on Saturday, March 5th. This year LCCB is selling tickets to allow you to lock down an allotment of bottles (limit is 6 bottles/person). It’s that time again, it’s RVA Beer Week (November 1 — 8)! This is a celebration of our collective craft beer culture. Since 2010, when this week of events was first enacted, our craft scene has exploded! Back then we were on the low end of the national average at about a 5% craft beer share of our total collective beer market. Now however, we are booming! With some estimates hinting at a jump to 16% craft beer share in 2015, more than tripling where we were 5 short years ago. Craft beer has become an integral part of our restaurants, festivals, and daily social life. Our area breweries have multiplied from 2 at the inception of RBW, to currently 14 area craft breweries pouring. The medals and awards for their amazing creations grow with each passing year. Our craft focused restaurants in town have won tons of accolades as well, and amazing growler stations and expanded bottle selections have opened at independent businesses and at local grocery stores. Even one of the most respected out-of-state craft power houses, Stone Brewing, has noticed Richmond. Choosing our fair city for their highly anticipated east coast location expansion! There is every indication that this is just the beginning of our cities craft beer renaissance, with an additional 7-9 RVA area breweries in planning that will debut to beer fans over the next year! So help celebrate our collective passion and support our scene! Take the opportunity to introduce a friend to craft beer in Richmond. Go out and drink at your favorite brewery or restaurant. Buy something to share from a bottle shop or growler station. Join us and rally around our amazing beer town! Cheers! Garden Grove enthusiastically welcomes the Roosevelt to our brewery in Carytown! Legendary Richmond Chef Lee Gregory takes the reigns for our inaugural Beer Dinner and it’s going to be DELICIOUS. Five courses of elevated, pub-inspired cuisine will be matched with five artisan brews in the comfortable, casual setting of our taproom. Farm-to-Table, Barrel-to-Glass. This is an event not to be missed! This dinner is sold out but take a look at what you could have been eating. Head over to the Pig & Pearl for a five course dinner with beer pairings from Lickinghole Creek Craft Brewery. Take a look at the menu. Tickets for the dinner are $70.25/person including tax and tip and can be purchased online here. Between this Sunday and next, you will have two chances to celebrate Oktoberfest at Metzger Bar & Butchery down in Church Hill. Head over tomorrow Sunday October 18th from 1 to 8PM as Metzger hosts an Oktoberfest block party complete with Fest-biers, Marzens, sausages and stein holding competitions. 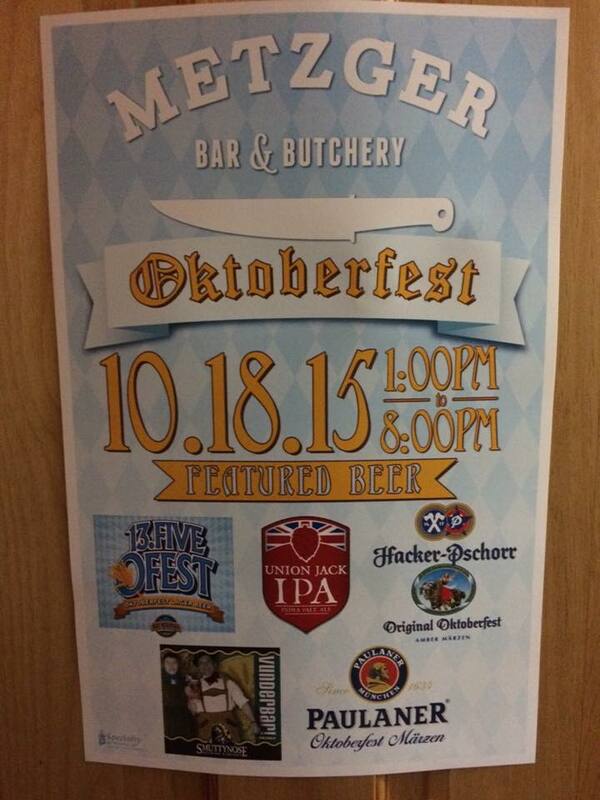 The event is free but if you buy tickets early on Eventbrite you will get a free Metzger Oktoberfest T-shirt. Beer and food tickets will be sold at the door for $5 each. Next Sunday October 25th, Metzger will host an Oktoberfest beer dinner featuring Devils Backbone. Take a look at the menu. Seatings for the dinner will start at 5pm and will be available throughout the night. Seats are $60/person and reservations can be made by calling Metzger at 804.325.3147. 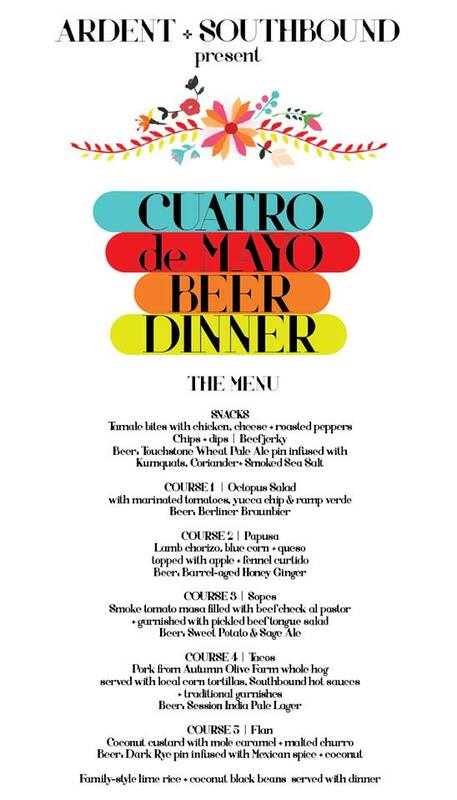 Get ready for a dinner out on one of the best patios in Richmond as Ardent Craft Ales and Southbound team up to present a “Cuatro de Mayo” Beer Dinner Monday May 4th starting at 6pm. This festive 5 course dinner will be Ardent’s first collaborative dinner served at the brewery. Take a look at the menu. All inclusive tickets for the dinner are $70/person and can be purchased here. If Monday’s forecast holds and I really hope it does, it will be a beautiful day for dinner outside. The dinner will be moved inside the brewery in the event of rain. My birthday is coming up this Monday and I know what I’m doing that day: Brown Distributing’s trade show! I’m mean how could I not. But what about a special dinner? That’s where my dilemma comes in. Of course, I could go anywhere that night but why not wait until Tuesday April 28th when I could choose between two beer dinners? LCCB and Betty on Davis have teamed up for a dinner to raise money for the Richmond SPCA. Take a look at Chef Trevor Knotts’ menu. Tickets for the dinner are $75.15/person and include a 10% donation to the SPCA. You can purchase your tickets online here. Chef Zhao will be cooking up five courses of Strangeways. Check out this menu. The cost for the dinner is $50/person plus tax and gratuity. Reserve your spot by calling the restaurant at 804-354-9888 or emailing Pedro@eatrestaurantpartners.com. What do you guys think of these choices? What would you do?